We've been a Colorado leader in purebred Angus bull sales for over 50 years. 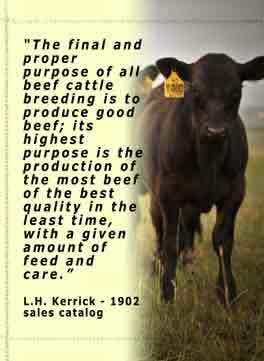 At Aristocrat Angus Ranch we take a balanced and practical approach to breeding high quality Angus seedstock. Each year we select the very best of our bull calf crop to be developed into the type of sires that cow/calf producers can benefit from. Phenotypically correct with the genetic potential to produce fast-growing, easy-fleshing calves that will pay premiums for carcass quality. We believe that our customers are our most valuable asset and our aim is to develop long-term personal relationships that are based on trust and an oustanding product. To that end, we conduct all bull sales by private treaty, giving our clients the luxury of individual attention to their needs and the ability to select sire prospects in a relaxed and friendly atmosphere. If you would like to see what Aristocrat Angus genetics could do for your herd, please give us a call to schedule a viewing appointment.